Magic Sealant Trim can be applied over existing grout and sealant. 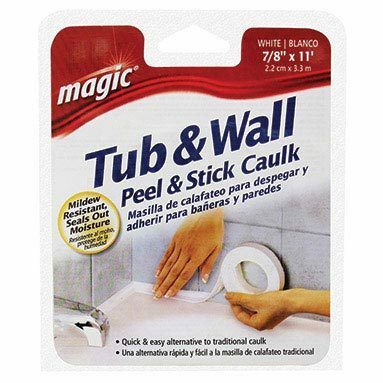 Remove any loose, protruding, or mildewed caulk. Thoroughly clean the surface and allow it to dry thoroughly. Measure the length to be covered and cut Sealer Trim to that length. Pre-bend Sealer Trim by folding it at the score line to form a 90° angle. Maintain fold during installation. Peel the first few inches of backing paper and begin to press the folded strip at one corner into the joint where the vanity meets the wall. Avoid stretching product during installation. Pressing the strip firmly against both vanity and wall, continue to peel the backing paper along the length of the surface. After installation, run your fingers firmly over all lengths to ensure good adhesion and watertight seal. Do not allow water to contact the strip for 6 hours following installation.